Runner-up Jahmene still counts winner James as one of his closest friends from the competition, but says he'll wait until January to spend time with him. "I know that his schedule is going to be absolutely crazy. So I'll just give him some space and harass him in the New Year!" Jahmene said. The former supermarket worker was known for his soul and gospel singing style, but doesn't see his career as being stuck to one genre. "I think my album would be so mixed. Think of Whitney Houston's My Love Is Your Love album - that kind of mix between ballads, gospel and R'n'B, a bit of jazz," he said. "I'm just trying to get back that music from the olden days, because I'm missing it." As part of The X Factor final, both James and Jahmene recorded a single, with only the winning contestant's song to be released. James' version of Shontelle's Impossible became the fastest selling single of 2012. 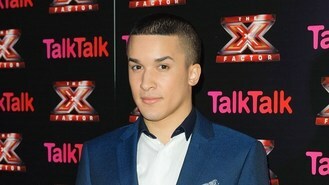 Speaking about his own track from the final showdown, Jahmene said: "I'm hoping to release Let It Be. It would be a shame to let it go to waste." Both contestants are scheduled to appear on The X Factor tour, along with five other finalists, including second runner-up Christopher Maloney and controversial contestant Rylan Clark, in January.